It is a true pleasure to have author and photojournalist Kendall Hunter as my guest blogger today. 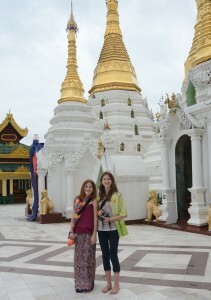 She’s fresh off a trip to Thailand and Myanmar with her two daughters, but it wasn’t just any kind of trip. No, these three women are out putting their special mark on the world, as you’ll read below (and here on Kendall’s blog). It’s been my good fortune to have Kendall as a friend for eighteen years. We met in South Africa and experienced that country’s transition to democracy together (out of which came her book Black Taxi). Our friendship continued when we lived in Vancouver; later, we rendezvoused in Frankfurt and Zurich. Over the years, no matter the place, one thing has remained strong and true, and that is Kendall’s desire to authentically and honestly tell people’s stories, with care, intention and integrity. And she’s one hell of a fantastic role model to her children, to boot. I hope that you’ll get to know Kendall a little bit here, then stay in touch on Twitter and Facebook to join her on her future journeys. My umbrella sits on my head like a rice hat while I use both hands to hold and focus my camera. The August monsoon rain is smearing street life in front of me with an irresistible effect. “Mom, I’ve got a taxi!” my youngest daughter shouts. I’m focused on a man clutching an umbrella while riding his bike as a beaten down Toyota Corolla pulls up in front of us. Despite being drenched, I don’t want to stop shooting however, taking one look at my daughter, decked out in plastic bags, I tuck my camera back in my bag and approach the driver. He studies the address that I’ve handed to him of my friend’s home on Inya Lake, outside of Yangon. It’s written in Myanmar and is some 20 minutes away (double that in rush hour). Shaking his head, he pulls off leaving us standing, giggling in the rain. What would you do if you knew you’d have just enough money to make sure you and your family would be ok for the next four years? I’m not talking buckets of cash here, just enough to allow you to think about what really matters; not so much that you get distracted and take your eye off the ball. I asked myself that a year ago; this is how I found myself with my two daughters in Yangon, soaking wet with camera in my hand, happy as a clam. We’d been in Thailand prior to this. I’d been interviewing photojournalists for my forthcoming book and my two daughters were invited to participate in a photographic workshop. Their enthusiasm for documenting our travels was magnificent and by the time we hit Myanmar, it was quite natural for them to encounter this country lost in time with cameras raised. Personally, despite having worked as a photojournalist, I hadn’t been taking many photographs over the years but decided to write a book about those who are. It’s been far more than a method of survival as I shake off the effects of a bitter divorce; it’s my way of ensuring I remain the person I want to be for my daughters. Hence the above question. You see, I have a few years of alimony ahead of me and I’ll be damned if I’m going to come out of this a bitter, miserable woman. Myanmar is a country undergoing transformation. Kentucky Fried Chicken and McDonald’s are waiting on the doorstep of the country’s liberalized economy. Actually, KFC has already knocked and entered. 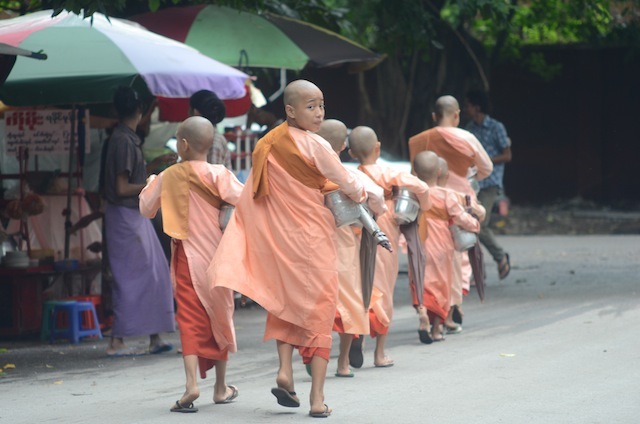 The way was paved for them by a flood of protesting monks, a treacherous cyclone and the resulting diplomatic activity that allowed for the release of their most famous political prisoner, Aung San Suu Kyi, from house arrest. The timing of our visit was auspicious. For me, it echoed a time in my life that I was now reaching back to when I worked as a photographer on a newspaper in South Africa. Where I was now seeing Suu Kyi t-shirts for sale on the streets of Yangon, in Johannesburg some twenty years ago, it was those of Mandela and the new South Africa. Both had been political prisoners devoted to the process of democracy, then faced with the indomitable task of leading their countries away from years of oppression and corruption. 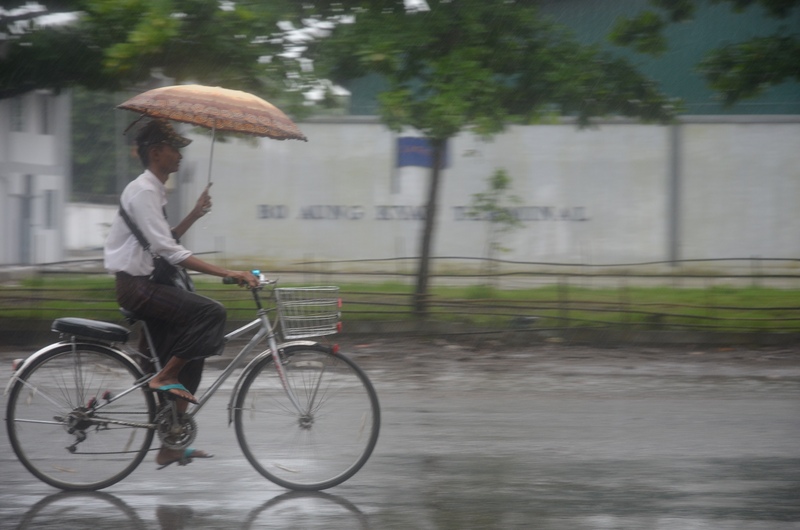 Nowhere is change more apparent in Yangon than in the daily commute into the city centre. A rapid increase in car imports has made a huge impact on the flow of traffic. People stuck in traffic jams are perpetually approached by men holding Suu Kyi souvenir books. “This wouldn’t have happened six months ago,” our driver explained one day. I found myself wishing for the quaint preservation of this untouched land yet its very neglect was vivid proof of the need for both the empowerment and change lurching through the country. With only a few days in the country, we discovered how content we were to simply walk the streets captivated by sparks of modernization amidst old colonial ruins. We moved through Yangon with our cameras, framing men in their longyi (full-length sarong), their teeth deeply reddened from chewing betel nut. 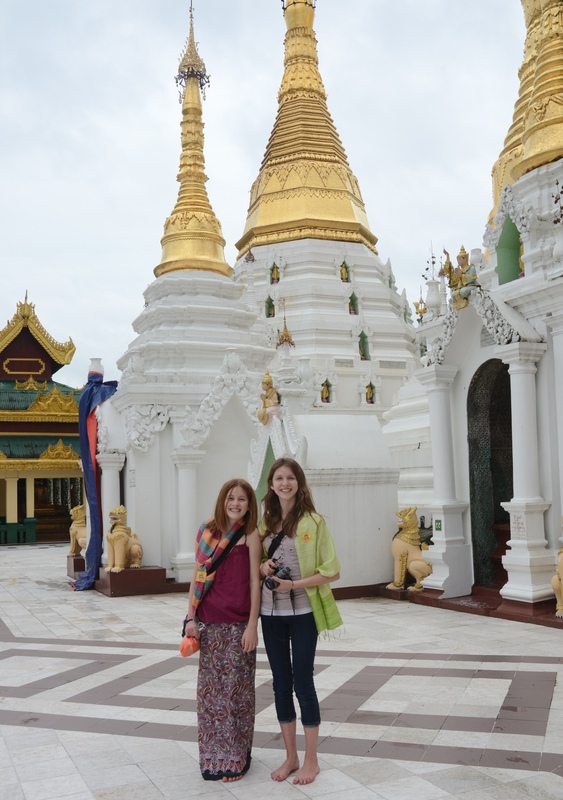 Monks in burgundy robes ascended steep stairways of gilded pagodas, the grandiosity of which takes your breath away. We navigated sidewalks long neglected, gawking and tripping, yet ultimately stirred by the faces of people who will be affected, for better or worse by tectonic shifts taking place around them. 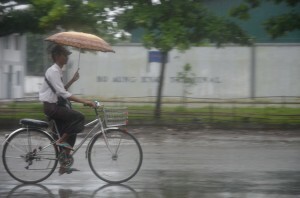 It so happens we’re stranded in the rain on Strand Road along the Yangon River. I know that the Strand Hotel, where Rudyard Kipling purportedly wrote The Jungle Book, is not far away but as my camera lens fogs and another taxi nears, my kids and I decide to call it a day. As broken windshield wipers struggle valiantly against the downpour, I can barely see the road ahead. My feet are soaked from rain water coming up through a hole in the taxi’s floor. The windows are cracked open to compensate for a broken fan and a small puddle is accumulating on my seat. My kids (sans seatbelts) are in the back seat waving madly at people on buses — enjoying placid faces as they crack a smile. Our driver pulls out around a stalled vehicle, straight into oncoming traffic. I tense in the seat next to him, well aware of my passenger status, and watch him make his way through rush hour and the onslaught of modernization. Pulling my camera out for what is probably the last time in Myanmar, I take a few shots through the windshield. In a few short weeks, this small black box has become an extension of me, once again. Not only that, it has served as an intimate connection to the world for my daughters. Over there is no longer so far away. This choice I’ve made—to make it an accessible place, and one I hope will remain in their giggling hearts forever—has already paid off. If you had enough money, for a short while, to do what it is that matters to you, what would you do? Kendall Hunter is a native of Banff, Alberta. 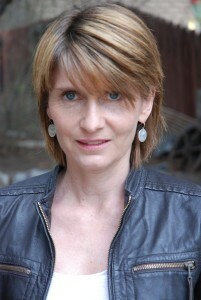 She is the author of two books: Black Taxi: Shooting South Africa (Turnstone Press, Winnipeg) and Culture Smart! : Switzerland (Kuperard, London). She’s freelanced for Tonic.com, The Globe & Mail, The World & I, and various Swiss travel and parenting magazines. 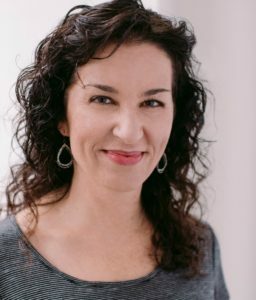 Kendall recently moved back to Banff with her two daughters after living ten years in Zurich, Switzerland and is now working on her third book, a memoir entitled Intimate: Photographs; Women in the World and Why They Matter. Wow! I would love to travel like that and show my kids the world. My husband is too afraid, but I am not. It only feels awesomely free to me! Kendall, thank you for sharing your writing, your photos, and your inner self. You write so beautifully, so succinctly, and from the heart. Thank you, Mona. Enjoy your travels! Very interesting blog and nice to meet Kendall! And what a wonderful way to introduce the world to your daughters. Thank you Mary, for the comments and “meeting” me here. Hi Kendall! Laura knows the most interesting people, and you are clearly one of them. How wonderful for your daughters that you chose to show them bravery, courage, resilience, flexibility, and a joyful will to experience the world. …and you must be one of those interesting people too! Thanks for the lovely comment Molly. So lovely to meet you via the lovely Laura’s blog. What a fascinating journey you and your daughters have embarked on, and how beautifully you describe it. I’ve hied myself over to your blog, Facebook and Twitter pages (I’m not a stalker, really!) so I can follow along (okay, that sounded a wee bit stalkerish) and see where the journey takes you next. You well know ‘life’ likes to test us, but if you and the girls keep those giggles going it can actually defeat a Monsoon.. Love You. What a fascinating story. And I love the pictures. I’d love to visit a foreign country. Rita, glad you enjoyed it and thank you for your comment!